It's almost every day that your author learns something new about London and he didn't realise until he visited last night for the launch of Issue C of Curiocity Magazine that tiny 13th century St Ethelburga's Church on Bishopsgate is no longer an active City church, but is in fact a Centre for Reconciliation and Peace with regular programmes and events to help individuals and communities resolve conflict, complete with an exotic-looking tent space at the back. 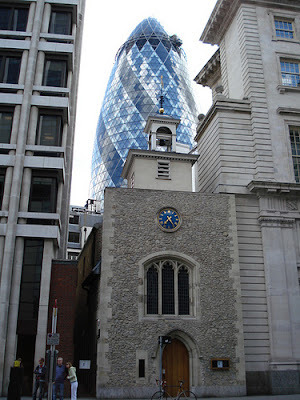 This use was presumably chosen for the church after it was almost destroyed by an IRA bomb on Bishopsgate in 1993, and saved from destruction following a public campaign. Today, it is home to lunchtime meditation, musical evenings and courses on topics such as conflict resolution. You know it's only the facade of this that's old? Go see it now. The building on the left in this pic has been demolished and you can see the side of the chapel building. It's definitely not old. True story. This church dates back to the Thirteenth Century. It was rebuilt approximately ten years after its partial destruction by the IRA bomb, and although the facade was totally reconstructed at this time it used much of the original masonry and timbers. The stained glass window was specially commissioned, but the stonework to this window is all original. Take time to go inside - a concious effort was made to highlight the difference between the original and new construction. I just found out my 3rd great grandfather got married here in 1856 so pleased !